A mother with an infant strapped to her chest was kicked out of a country music concert in San Diego after officers told her she was in the pit area much too close to speakers amid a large crowd, endangering her baby. The mother herself caught the confrontation on video at the Brad Paisley concert at Sleep Train Amphitheatre on Thursday. She identified herself as Megan Christopherson, 30, in the 10-minute clip posted to YouTube. The video has since been removed. Both the mother and Chula Vista Police Department (CVPD) officers have differing accounts of why she was booted from the venue. According to the CVPD, concert security reported Christopherson was in the pit area near the stage several feet away from the speakers. As seen in the mother’s video clip, a security officer approached the woman and asked her to move from the pit area due to possible danger to the baby. Officers said the child could have been crushed from a potential crowd surge or could’ve been impacted by the loud noise coming from the nearby speakers. Christopherson argued that her 4-month-old baby Gracie, who was fast asleep, was fine. She said she had recently taken the infant to another concert at the venue and experienced no problems with security. The security officer continued to inform the mother of the dangers posed to her child if she remained in the pit. Christopherson was then given two options: to be relocated to a seated area in the amphitheater free of charge, or to leave and receive a full refund on her concert ticket. Ultimately, the mother chose the refund and left the venue. However, Christopherson argued she had been targeted by security for breastfeeding her baby in public at the concert, not necessarily for being in the pit, and wondered if that was the reason she was ousted. In the video, the mother told the security officer that other security personnel had allegedly told her to stop breastfeeding her child due to complaints from fellow concertgoers. “A security guard came and took a picture of me,” the mother said. The CVPD agreed. “The Chula Vista Police Department’s involvement in the incident was due to the welfare and safety of the infant and not due to a mother’s legal right to breastfeed in public," it said in a statement released Friday. Still, one of Christopherson's friends told NBC 7 the woman was asked to stop breastfeeding because it was "making others uncomfortable." “Security continued to stand next to her and even photographed her, taking the photos to the supervisor,” the friend said. NBC 7 spoke with Christopherson on Friday, who maintained that breastfeeding became an issue at the concert. “I’m shocked. I’m disgusted at our society that women are shamed into nursing in bathrooms or their cars or feeding their baby a bottle only, because they’re scared to nurse in public,” she said. Christopherson believes officers removed her for breastfeeding in public but "covered it up" by claiming it was due to the safety of her baby. “It was completely a cop-out. They’re trying to cover this up because they know they legally can’t remove me for nursing," she added. The mother insisted baby Gracie was never uncomfortable in the pit or in danger. The online video generated a debate while it was live on YouTube, with some comments offering support. Others questioned why she brought the infant to the concert in the first place. The CVPD said the South Bay Family Protective office was consulted regarding the mother's case. In the video, the officer can be heard telling Christopherson that he's contacted the San Diego County District Attorney's office regarding the incident. NBC 7 reached out to the DA's office and a spokesperson said they could not comment on the matter and said the office may get the case. 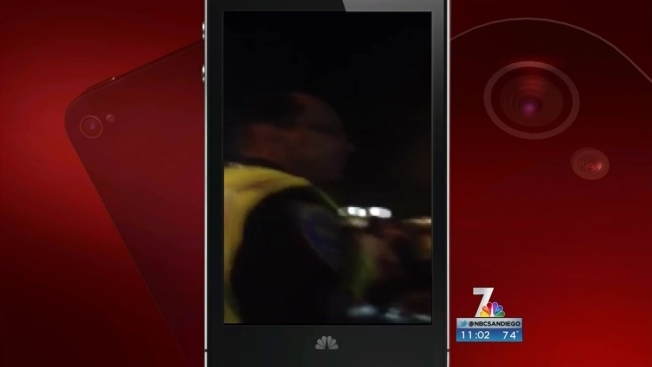 A CVPD lieutenant told NBC 7 Christopherson was not cited at the concert and the incident was still under review. Christopherson told NBC 7 she planned to seek legal representation and wanted the concert security company to come forward with a formal apology. “We all parent our children completely different. That’s our right. You’re gonna choose something for your child that I’m not gonna choose for my child,” she added.